Perfectly named by my daughter, these flowers almost glow in stong golden yellow and orange-reds. This set has a larger focal flower in golden yellow with a red center, four medium flowers, two small flowers and two matching spacers. Wonderful colors for this time of year! One large flower 22mm x 16mm x 11mm thick, four medium flowers 17mm x 16mm x 10mm thick, 2 small flowers 13mm x 12mm x 9mm thick, two spacers 10mm x 7mm hole-to-hole. What a fun reaction in the glass on this set. 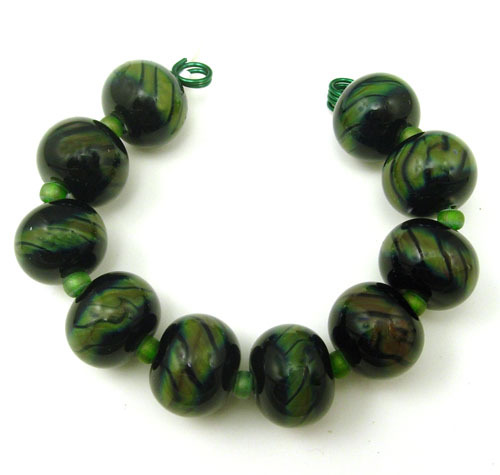 Deep jade and touches of brown are twisted with black around the middle of these beads. 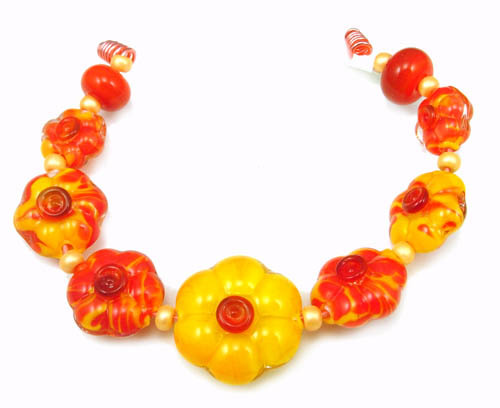 With 10 beads in this set, you'll have plenty of beads to play with. Ten beads 14mm x 11mm. I enjoy working with custom frit blends, and this one from Spiral Dance is just wonderful. Swirls in shades browns and lavender are accented by dots of fine silver. It's a very elegant combination with a touch of fun with the domed tabs and domed tiles. One domed tile and two domed tabs 19mm x 19mm x 13mm thick, two smaller domed tiles 16mm x 16mm x 13mm thick. 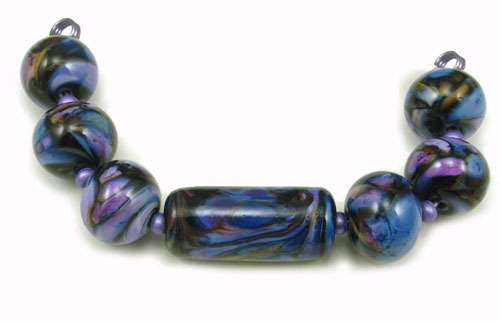 A fun day on google led to pictures of a purple nebula and those are the exact colors in this set of beads. 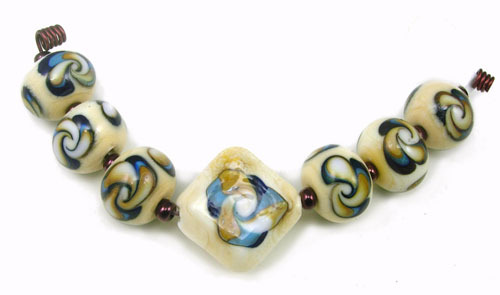 Swirls of purple, blue and brown on a black background, you'll get a cylinder focal bead with 6 nice sized matching round beads. I can't wait to use these colors again. Cylindrical focal bead 13mm x 30mm, four matching beads 16mm x 13mm hole-to-hole. Soft transparent purple glass is lightly dusted with matching opaque frit. Three different shapes in two sizes each give you 6 different beads in this set. You get lentils, tiles and rimmed capsules. Soft ivory and brown with strong turquoise and navy give this set a pottery feel. This could even be enhanced by etching, which I can do at no extra charge if it is preferred. One princess focal and 6 beads allow all the colors to be shown off well. Spring is on its way. The weather is getting warmer and the fun colors are starting to show up everywhere. 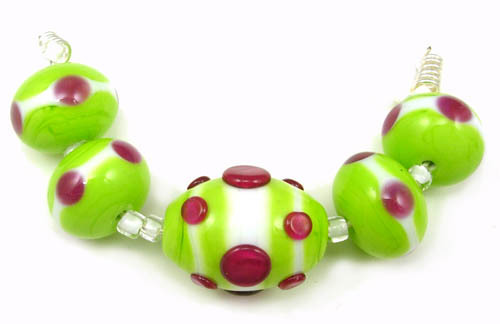 This set of lime green and white beads just pops with the hot pink polka dots. The dots are melted smooth on the 4 round beads and left raised for a fun accent on the barrel shaped focal bead. 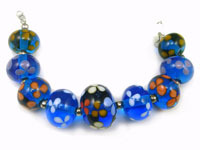 Aqua blue beads in matched pairs show off flowers in white, purple, coral, and orange. The center bead has flowers in all four of the colors from the matched pairs. Lots of surface area between the flowers allow the light to make the aqua glass shine. Eight round beads 13mm x 10mm, one focal round bead 17mm x 12mm. This set has all the retro colors that are back again. A dozen button beads have orange, yellow, light green and pale green dots scattered over the surface. With 12 beads you have plenty to work with, whether you are planning a necklace or a bracelet, with enough left over for a matching set of earrings. Four larger button beads 19mm x 8mm, eight smaller button beads 12mm x 8 mm. Named by my daughter, these 7 beads look just like a path meandering through a green garden. With 4 domed tabs and 3 matching spacers all with wandering lines through them, they are just waiting to be made into a new piece of jewelry for spring.